Ford of Europe has worked with Imagination to deliver a vehicle launch event to 2,000 dealers. 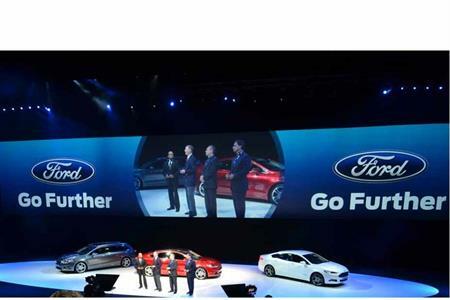 The Amsterdam event was used to launch a full family of vehicles under Ford’s new brand promise ‘Go Further’. The aim of the 6 September event was also to reveal Ford’s aggressive new product growth in Europe, leveraging the company’s One Ford global portfolio. Staged at the Ziggo Dome in Amsterdam, the event brought more than 2,000 Ford dealers from across Europe, as well as employees and 300 members of the press. The event was streamed live in seven languages via the purpose-built website www.gofurtherlive.com. An additional ‘as live’ stream was also made available in a further 10 languages. The aim was to reach an audience of up to 100,000 people. Guests were encouraged to use their phones to take photos and share the event through social media channels - a significant change in Ford’s business strategy. Imagination designed and produced the staging and content of the event. This included the auditorium with a 35m wide screen and six support screens, and the ‘showroom of the future’ – a representation of the new Ford retail space and future model line-up. Imagination worked with Ford to script the 90-minute event. More than 24 pieces of content were produced to support the event, including brand films, a Twitter feed, augmented reality activations and speaker support. As well as delivering the event, Imagination was responsible for arranging travel and accommodation for those attending the event in Amsterdam. Imagination’s Ford business head, Europe David Girling said: "When planning and designing this event, the decision was taken to create a simple but dramatic stage production to showcase the new products. The true stars are the Ford brand, the products, technology and of course, the Ford people. This event provided an opportunity to inspire a wide audience of people by bringing them into direct contact with the products and the Ford brand." Ford Motor Company president Alan Mulally shared a presentation on ONE Ford and the new brand promise ‘Go Further’, as well as a Q&A with the audience. Imagination worked closely with Ford of Europe’s marketing and public affairs team on the project, which took four months to plan and deliver.